Reliance Capital, which is looking to acquire Jignesh Shah-led Financial Technologies' stake in Multi Commodity Exchange (MCX), has complained to the regulator FMC about "lack of co-operation" and non-sharing of key information by the commodity bourse and the seller. In a strongly-worded letter sent to Forward Markets Commission (FMC), a copy of which has been sent to FTIL, MCX and Finance Ministry as well, Reliance Capital said it is very keen on acquiring the stake in the top commodity exchange, but is disappointed with the process being followed by the seller and the "lack of co-operation by MCX in providing critical information to potential investors." When contacted, Reliance Capital declined to comment, while an FTIL spokesperson said, "FTIL Board will meet and take a decision on the matter very soon and we will convey the same to all its stakeholders." "FTIL is fully co-operating with all the interested investors and it's merchant banker is following same standards for all," the spokesperson added. The regulatory officials, however, said Reliance Capital has also requested FMC to assume full control over the entire process related to this divestment to ensure that it is conducted in a "reasonable and transparent manner". Reliance Capital, the financial services arm of Anil Ambani-led Reliance Group, has also listed several other concerns with regard to this deal and has sought an urgent meeting with the FMC Chairman to discuss these issues. These concerns include those related to "several" party transactions between FTIL and MCX, potential taxation issues, technology contracts and concerns arising out of a PWC forensic investigation conducted on MCX at FMC's directions. Reliance Capital has also requested FMC to share a copy of the PWC report with potential investors before executing any binding agreement. The short-listed investors, which includes Reliance Capital, were earlier asked to execute a binding share purchase agreement by today. However, Reliance Capital has said it would not be able to do so due to lack of "critical information". FTIL has 26 per cent stake in MCX, out of which it wants to sell 24 per cent. Among potential investors, Reliance Cap has emerged as the highest bidder, while others reported to have bid include Kotak Mahindra Bank, BSE, Tata Capital, CME, Deutsche Boerse, DGCX, Warburg Pincus and Medist. FTIL has to divest stake in MCX as it has been declared as not 'fit and proper' to hold more than two per cent stake in the commodity bourse by FMC, following a Rs 5,500 crore (Rs 55 billion) payment crisis at its subsidiary NSEL in July last year. 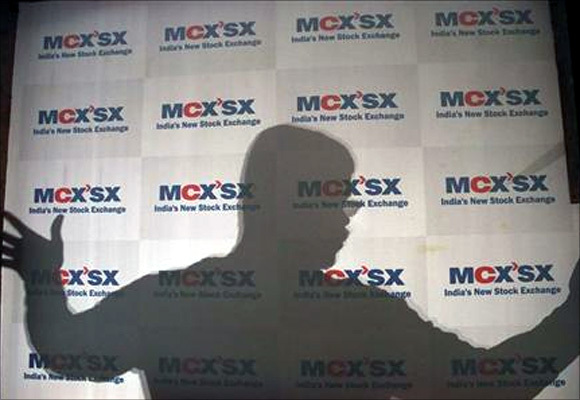 Farewell to MCX: From Jignesh Shah to Shah Jahan?